Tricks about how to make youtube videos can rotate automatically on a blog or website is very necessary knowledge possessed by someone who likes to upload videos on youtube. Because the ranking of our videos on youtube, also influenced by the many people who saw the video, or on youtube called "views". By creating an autoplay youtube videos, that means every person who visits our blog will be to see the video automatically. So the blog visitors do not need to squeeze "play" button on the youtube video box to view the video. Just simple, visitor visit our blog page and the video will rotate automatically. The first step is to grab embed code from youtube video to be posted on our blog or website. If not yet know where the codes are, look at the picture below. The second step is to insert the HTML code youtube videos autoplay on the video embed code that we have taken from youtube. 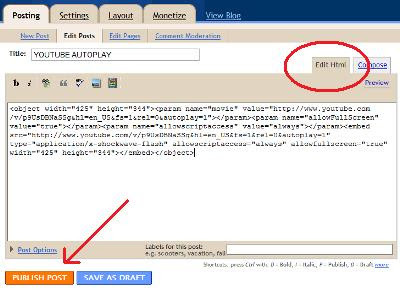 Paste the code&autoplay=1 after the video URL address. Consider carefully the existing html code below, the blue part. 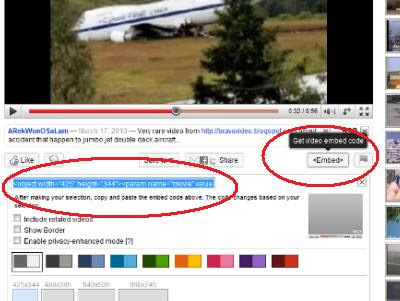 Having completed the youtube embed HTML code in the modification, we can immediately put it on our blog or website. Enter the embed through the postings edit HTML pages, then post. Look at the picture below for more details. 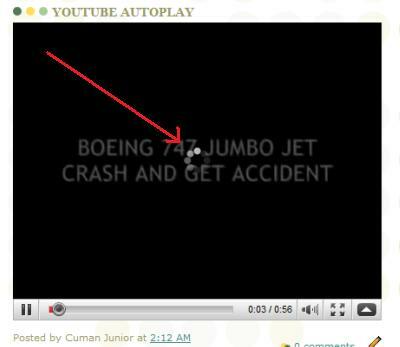 To view the results youtube video autoplay that we have create, try to open your website on the page of video locations. If your youtube video box automatically play when you enter your blog page, it is mean that you have succeeded. It was marked with the video loading, such as the image below. Good luck with these simple tricks!